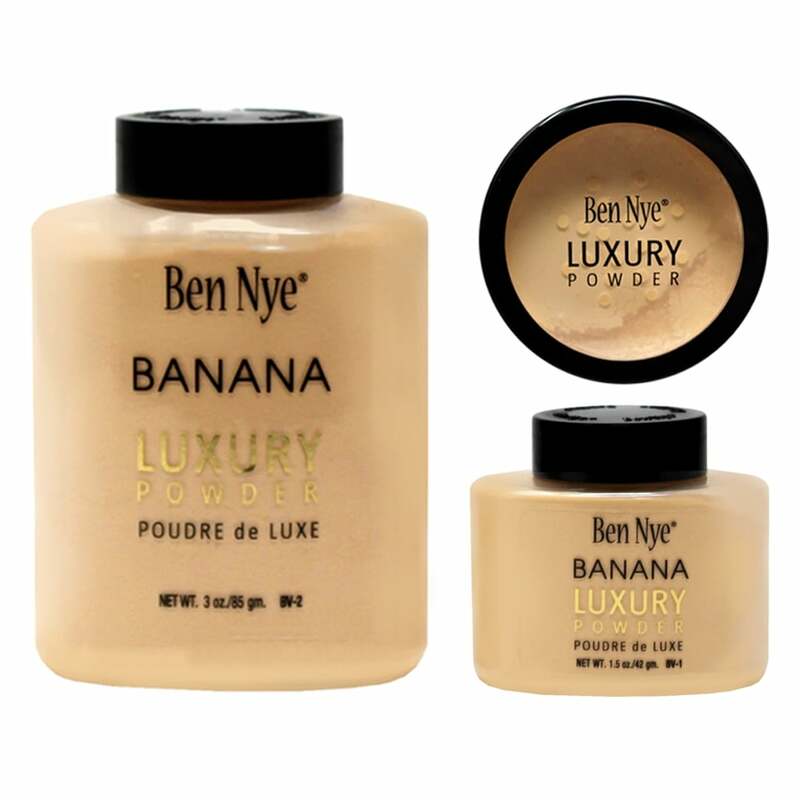 Ben Nye Banana Luxury Powder is a finely-milled finishing powder that sets makeup securely for all-day wear whilst imparting a gorgeous, soft-focus effect. Suitable a broad range of skin tones, Banana Luxury Powder is ultra-translucent and mattifies the skin for an airbrushed effect that doesn&apos;t look chalky or dry. With Kim Kardashian West being a reported fan, Ben Nye&apos;s Luxury Powder has garnered &apos;cult&apos; status across the globe. Justmylook is a fully authorised Ben Nye stockist. Completely cruelty-free. Neutralises dark under eye circles. Using a small powder brush or makeup sponge, apply to the face where needed and blend out. Can be used to highlight or set the entire face. Review Summary - 4.7 out of 5 based on 33 ratings. Goes on a treat... oily skin and purchased for a winter wedding but make up was saved!! Highly recommended- don’t go for cheaper alternatives!! Great powder leaves a fantastic finish and makes make up look flawless. Banana is too yellow for my fair skin and leaves a yellow finish so I have ordered the translucent luxury powder. Best powder ever! Exactly as described and genuine. Love this powder!! Does was it says on the box and sooooo much more! This product is great Like the texture on my skin . Very minimal lines and last all day. Love this product but do wish it was easier to dispense as I waste a lot. Dispense into the lid and it goes everywhere but better than straight on the brush. Gives a flawless complexion though which is the main reason I love it. Very authentic and doesn't make my skin look caked up and heavy looking. It's very smooth and definetely does make my make up look glowy and fresh Everytime I need to apply it which is 3 times for me because I have oily skin. So overall I am very pleased. Packaged great. Delivery was also good. Amazing powder! I’m already noticing less oil seeping through my make up, better than the Laura Mercier one. The powder is suits my skin tone but when used under the eyes it is a little drying. So far very happy with this product - it sets make up for the day and gives me a 'finished look'. The big tub is the best value for money, it lasts me more than half a year and I use it almost daily. I've tried various 'cheaper' banana powders but this one is by far the best! The original and the best, don't be duped by cheaper drug store copies! Arrived quickly and is exactly as expected, this is a genuine product. The powder itself is great, I've been using it for quite a few years, it's traditionally quite hard to get hold of in the UK so happy I could get it without paying extortionate shipping fees!!! Better than the copy cat products out there. I've tried the Makeup Revolution powder and the W7 one and they're okay, but nowhere good as this.